The bowline is nicknamed “King of the knots” due to its simplicity and multiple applications. It is also called a rescue knot. 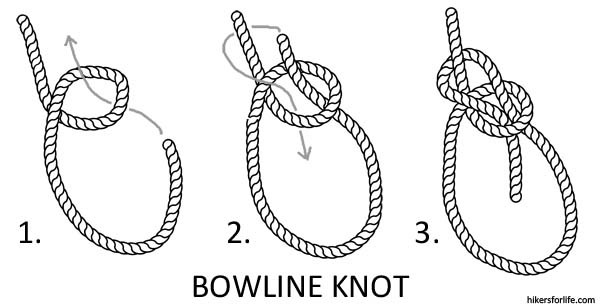 The bowline ties a fix loop onto the end of a rope. Under tension, the knot never slips. This means that the loop at the end of the rope “never changes in size.” The loop will not turn smaller or larger while under tension. 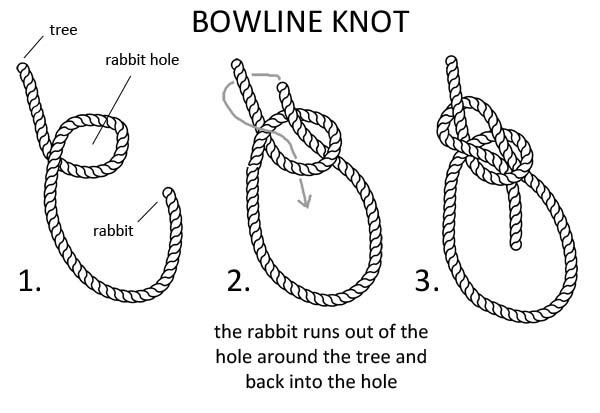 Two practical usage of bowline while hiking. Used when you cross a fast flowing river or used when you are rescuing a person who has fell into a hole or over a cliff. In both instances, the loop is wrapping the subject’s waist. Even if the subject slips while crossing the river or climbing up the hole, the loop stays secured holding onto the subject’s body. This prevents the subject from being sweep away by the river or sustaining another bad fall.